A volcano is a hole in Earth's surface through which magma (called lava when it reaches Earth's surface), hot gases, ash, and rock fragments escape from deep inside the planet. The word volcano also is used to describe the cone of erupted material (lava and ash) that builds up around the opening. Volcanic activity is the main process by which material from Earth's interior reaches its surface. Volcanoes played a large part in the formation of Earth's atmosphere, oceans, and continents. When Earth was new, the superheated gases within it (including carbon dioxide) streamed out through countless volcanoes to form the original atmosphere and oceans. Volcanoes are found both on land and under the oceans (where they are called seamounts). Geologists label volcanoes by their periods of activity. If a volcano is erupting, it is called active. If a volcano is not presently erupting but might at some future date, it is called dormant. If a volcano has stopped erupting forever, it is called extinct. Generally, volcanoes are labeled extinct when no eruption has been noted in recorded history. Caldera: Large circular depression formed when an empty magma chamber causes the collapse of the volcano above it. Chemosynthesis: Process by which the energy from certain chemical reactions, rather than light (as in photosynthesis), is used by some organisms to manufacture food. Hot spot: An upwelling of heat from beneath Earth's crust. Ignimbrite: Rock formation that results from a large pyroclastic flow. Lava: Magma at Earth's surface. Magma: Molten rock deep within Earth that consists of liquids, gases, and particles of rocks and crystals. Pyroclastic flow: A dense wave of superheated air and rock that moves as a fluid from an erupting volcano, sometimes crossing thousands of square miles of landscape. Seafloor spreading: Spreading of the seafloor outward at ridges where two oceanic plates are diverging. Tuff: Fused hard rock formed from a large pyroclastic flow. According to the geologic theory called plate tectonics, Earth's crust is broken into various rigid plates that "float" on the surface of the planet. The plates move in response to intense pressure created underneath by the movement of currents carrying heat energy from the center of the planet to the surface. This pressure causes plates to move toward or away from each other (and also past each other in a horizontal motion). Volcanoes form on land near coastal areas when a continental (land) plate and an oceanic plate converge or move toward each other. Since the oceanic plate is denser, it subducts or sinks beneath the continental plate. As the rock of this subducted oceanic plate is pushed farther and farther beneath the continent's surface, extremely high temperatures and pressure melt the rock. This creates hot, buoyant magma that then rises toward the surface. When the magma reaches the crust, it collects in a magma reservoir or chamber. When pressure inside the reservoir exceeds that of the overlying rock, magma is forced upward through cracks in Earth's crust. Hydrothermal vents are cracks in the ocean floor or chimney-like structures extending from the ocean floor up to 150 feet (45 meters) high. Due to nearby volcanic activity, these vents release hot mineral-laden water into the surrounding ocean. Temperature of this fluid is typically around 660°F (350°C). Often, the fluid released is black due to the presence of very fine sulfide mineral particles (iron, copper, zinc, and other metals). As a result, these deep-ocean hot springs are called black smokers. Hydrothermal vents usually occur at midocean ridges where new seafloor is created. Hydrothermal vents are surrounded by unusual forms of sea life, including giant clams, tube worms, and unique types of fish. These organisms live off bacteria that thrive on the energy-rich chemical compounds transported by hydrothermal fluids. This is the only environment on Earth supported by a food chain that does not depend on the energy of the Sun or photosynthesis. The energy source is chemical, not solar, and is called chemosynthesis. Seamounts (underwater volcanoes) form when oceanic plates both converge (move toward each other) and diverge (move away from each other). When oceanic plates converge, one sinks beneath the other, creating a deep-sea trench. Rising magma from the subducted plate then rises to form volcanoes along the trench. When oceanic plates diverge, magma seeps upward at the ridge between the plates to create new seafloor (a process called seafloor spreading). Volcanoes form on either side of the ridge. Hot spots are special areas where volcanoes form apart from plates converging or diverging. Hot spots are a common term for thermal plumes of magma welling up through the crust far from the edges of plates. As a plate drifts over a hot spot, magma from Earth's interior rises and volcanic activity takes place. Some famous hot spots are Hawaii, Yellowstone National Park (United States), Iceland, Samoa, and Bermuda. Volcanoes erupt different material, and they each have their own style of erupting. These varied eruptions result from the differences in magma that each volcano contains. 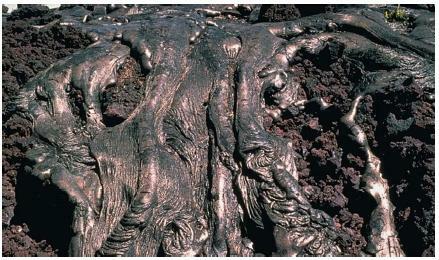 Magma that is low in gas and silica (silicon dioxide, a compound found widely in rocks and minerals) yields a gentle flow of thin, quickly spreading lava. In contrast, magma that is rich in gas and silica gives rise to violent explosions: the thick, tarlike magma may plug up the volcanic vent, blocking the upward movement of the magma until built-up pressure blows away the overlying rock. Geologists classify volcanic eruptions according to four chief forms or phases: Hawaiian, Strombolian, Vulcanian, and Peleean. but mild explosions. Lava arcs and steam-driven clouds of ash shower the dome with molten drizzle. A Vulcanian phase occurs when a magma plug has blocked the volcanic vent. The resulting explosive eruption hurls tons of almost solid magma into the sky, and a vapor cloud forms over the crater. The most violent eruption is the Peleean, named after Mount Pelee on the Caribbean island of Martinique. Fine ash, thick lava, and glowing, gas-charged clouds are emitted, traveling downhill at a tremendous speed. Fierce rains often accompany eruptions because of the release of steam from the volcano, which then condenses in the atmosphere to form clouds. Volatile gases in the magma also fly into the atmosphere upon eruption. These include hydrogen sulfide, fluorine, carbon dioxide, and radon. A dense wave of ash, superheated gases, and rock that moves as a fluid from an erupting volcano is known as a pyroclastic flow. Flows travel downhill at speeds more than 60 miles (100 kilometers) per hour, filling existing valleys with the fluid mixture. This material deflates as it cools. The rock formation that results is called an ignimbrite (pronounced IG-nim-bright), and the fused rock is called tuff. Ignimbrites can cover hundreds of square miles of landscape, such as the Mitchell Mesa Tuff of West Texas. When a volcano erupts such a large volume of material, often emptying its magma chamber, the central part of the cone is left unsupported. As a result, the crater and walls of the vent collapse into the hollow chamber, creating a large circular depression known as a caldera across the summit. The famous Crater Lake in southern Oregon formed in this way. The size and shape of a volcano is dependent on the history and type of its eruptions. Based on this, geologists classify volcanoes into four shapes: cinder cones, composite cones, shield volcanoes, and lava domes. Cinder cones are built of lava fragments. They have slopes of 30 to 40 degrees and seldom exceed 1,640 feet (500 meters) in height. 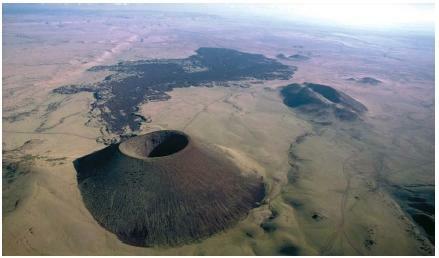 Sunset Crater in Arizona and Parícutin in Mexico are examples of cinder cones. Composite cones (or stratovolcanoes) are made up of alternating layers of lava, ash, and solid rock. They are characterized by slopes of up to 30 degrees at the summit, tapering off to 5 degrees at the base. Mount Fuji in Japan and Mount St. Helens in Washington are composite cone volcanoes. Shield volcanoes are built primarily by a series of lava flows that pile one on top of another. Their slopes are seldom more than 10 degrees at the summit and 2 degrees at the base. The Hawaiian Islands are clusters of shield volcanoes. Mauna Loa (on the island of Hawaii) is the world's largest active volcano, rising 13,680 feet (4,170 meters) above sea level. Kenya's Mount Kilamanjaro, the tallest mountain in Africa, is a shield volcano. Lava domes are made of thick, pasty lava squeezed like toothpaste from a tube. Examples of lava domes are Lassen Peak and Mono Dome in California. Numerous volcanoes erupt around the world every century, usually in sparsely populated areas. Even so, volcanoes have threatened human civilization throughout history and will do so as long as people live on Earth's often violent surface. An ash fall from Mount Vesuvius buried the Roman city of Pompeii in A.D. 79. The volcano, which sent a column of hot ash 12 miles (19 kilometers) into the sky, struck down the people where they lived, preserving the shapes of their bodies where they fell in the ash. The nearby city of Herculaneum was covered by a pyroclastic flow that destroyed it in seconds. Pompeii remained buried until 1748, when construction workers first unearthed parts of the ancient city—much of it appearing as it did on the morning Vesuvius erupted. On August 27, 1883, the volcanic island of Krakatoa in Indonesia erupted, blowing an ash cloud 50 miles (80 kilometers) high then collapsing into a caldera. The collapse was heard almost 2,500 miles (4,020 kilometers) away. Resulting tidal waves reaching 130 feet (40 meters) killed 36,000 people in coastal Java and Sumatra. Spectacularly weird sky phenomena from this eruption included brilliant green sunrises and moon-rises in the equatorial latitudes, followed by day-long blue sunlight and bright green sunsets. On the morning of May 18, 1980, Mount St. Helens in Washington erupted with the force of more than 500 atomic bombs—one of the largest volcanic explosions in North American history. 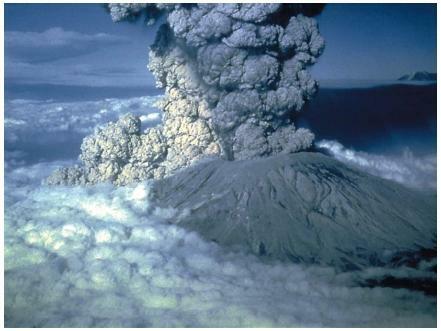 The blast, which sent a mushroom-shaped ash plume 12 miles (20 kilometers) high, reduced the summit (peak) by more than 1,300 feet (400 meters). Sixty people and countless animals were killed, and every tree within 15 miles (24 kilometers) was flattened. Ensuing landslides carried debris for nearly 20 miles (32 kilometers). The eruption of volcanoes through geologic time built the continents. The soil of some of the world's richest farmland draws its fertility from minerals provided by nearby volcanoes. The heat of magma boils water into steam that spins the turbines of geothermal power stations. Geothermal stations now light electric power grids in Iceland, Italy, New Zealand, and a other places. Enough heat flows from the world's volcanic regions and midoceanic ridges to power industrial civilization for several hundred million years. This power source awaits only the development of feasible geothermal technology. i need to know what plates collided that cuased the 1883 eruptio HELP! this is a very informational website, but i think the people that made it wasted their lives.... nobody actually wants to know this stuff.... =) nice try guys. This is great you know because it has help alot in doing my assignment. this was very helpful for my project!! thank you a whole bunch!! Thankz for making this site...It helps me a lot in reviewing my civil service examination. Hope i catch up all of these.. Thanks for the information. It was very usefull for my daughter Sandra that´s in 2º grade. She has to presenta project about volacnoes. this site was so helpful! its awesome! whoever made this website is very smart! thanks again, this was great help for my volcano midterm topic paper issue discussion essay! This is really helpful, if there is anymore information about rocks, volcano's and earths crust; things like that then please email any information on them things. i need to know what the procees of an explosive volcanic eruption is PLZ HELP~! Simple words yet knowledgeable. You can imagine the images described here and infos are well-explained. A small article with vast data. VERY GOOD. Thanks a lot.